The month of March is designated as National Women's History Month. 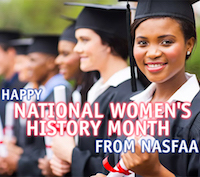 In celebration, NASFAA is looking back at the amazing women who have contributed to the association, the field of financial aid, and students across the country. NASFAA recognizes outstanding individuals each year at its National Conference for their contributions to the profession with a series of awards. Last year, women took home awards in each of NASFAA's five categories for which members were nominated for their never-ending work to better the lives of students. NASFAA's Most Valuable Professional is a series that features a brief Q&A with a different NASFAA member every couple of weeks. Take a look back at the host of inspiring women that we've featured over the years, and read about the challenges they overcame in their careers in financial aid. You can also send us the names of potential future MVPs and a short note about why you're nominating them to news@nasfaa.org. Women have held the role of NASFAA's national chair for the past three terms. Lisa Blazer of the University of Texas at San Antonio was our 2016-17 national chair, followed by Billie Jo Hamilton of the University of South Florida, and our current chair, Lori Vedder of the University of Michigan-Flint. Plus, our national chair-elect for 2019-20 is Paula Luff of DePaul University and our 2020-21 national chair-elect is Brenda Hicks of Southwestern College. Browse through our full list of past national chairs to discover more women who have led our assocation. To celebrate our 50th anniversary, we asked our members from different regions to submit their students' Student Aid Success Stories. The stories we received show the enduring value of financial aid for college, and the important role it plays in helping people achieve their goals. Many of these articles feature women whose strength and passion pushed them to reach their educational goals and serve as mentors for others.